First step is too build a high cage with no gates in it for the animal. They climb out and they open gates. 2018 I sunk my pen below ground level about 4 blocks. Then lined the sides with stone blocks. I topped the stone with 2x4 grates -not the opening ones. These give a good view and the animals stay in. Players say they have good luck with plank and board walls also. 1.Find an animal, have your rolling pin equipped and approach slowly. 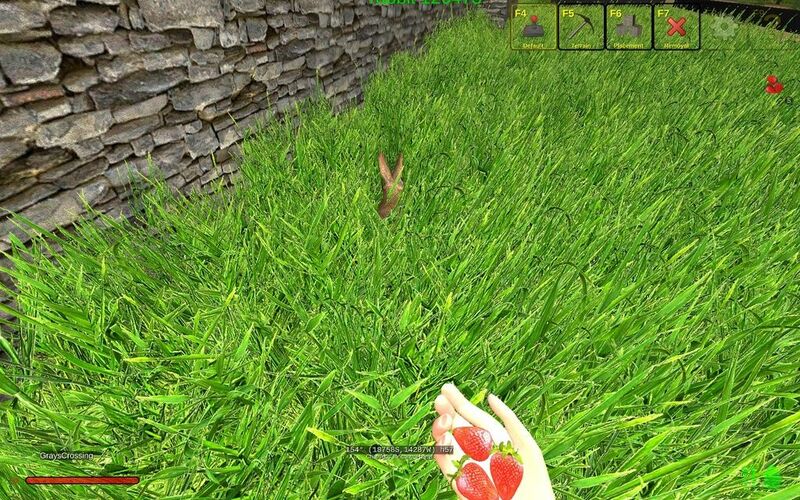 2.Stand next to the animal, hold food in your hand and point it at the animal.In chat, you can see that the animal will say "Yum" If it likes the food. It also says "Thank you" at end points. 3.After you feed it its favorite food several times, you will get a message in chat saying: "AnimalNamexxxxx belongs to you". You may have to feed it several diff. foods to get the to eat it. 2018 In game, type /abm help. This will give you a list of food that each animal will eat. 4.Now point theRolling Pin at your animal and see message in chat:"AnimalName XXXXX is following you" - to stop it following you, point the rolling pin at it again. 5.Check to be sure the animal is following you, and then you can teleport home with both the animal and yourself. 6. I find it best to have the cage you already prepared for it, close to the spawn spot. If not, be sure to check the animal is still following you. Lead it into the cage. 2018 notes now say that the animal will no longer wander further away from the place you leave it, than 20 blocks and it will return on its own. I am testing them again this week and not sure if this is true. I will find out. To breed animals requires a pair of animals. And they must be caged. 1. Feed one of your animals several times and watch the chat box - when it says: "AnimalName xxxxx wants tobreed" stop: repeat feeding the other one. Somewhere in the feeding process,your animals transform into male and female. 2. Again feed both of them several times, and watch for chat to say "AnimalName xxxxx is pregnant". 3. On screen the pregnant one will show readings of "1% pregnant", ticking thru to "99% pregnant". Immediately after the 99% blinks, the screen shows that the new animal has been born. And you a have a new animal. I didn't time the pregnancies unfortunately, as I was extending the cages and had both the cow and pig pregnant within about 10 minutes of each other. I do know it was 2 hours -at least. 2018 I don't think this changed much, but I will time it and add it here. 1. Holding a piece of paper in your hand, stand near the animal, a window will appear on screen. Type in the 'owners name' if you want, and name the animal your choice. As of first week of Jan. the plug in appears to be having a problem with naming. It is being worked on I heard. 1. So far I have learned that the birth of an animal counts 1 point. After catching a pair of cows, sheep, and pigs and breeding them, I accumulated 15 points. The birth of each new animal game is 1 point each. I have 18 points at this point. 3. These points let you earn pets. To collect them, you apparently have to drop an item on the ground to collect the pet you earned. I'm guessing here. I haven't accumulated enough points to be sure of this step yet. 4. Fox= 60 points. Drop an aluminium ingot on ground. Penguin= 50 points. Drop a gold bar on ground. Rabbit = 40 points. Drop a silver bar on ground. Mini-Pig = 100 points. Drop a mithril bar on ground. Rat = 100 points. Drop a lightbulb on the ground. Edited 1/15/19 I have tamed, penned, and bred enough animals now to have accumulated 40 points. I dropped a silver bar on the ground. And immediately got a rabbit. However, the rabbit took off like a rabbit. I had to chase it all over my property, feed it, and pen it up. This surprised me, because this is not what I expected. The chat instructions led me to believe this is a Pet, an animal that stays with you. I may have read the instructions wrong. However, it works, as it does give a better chance to actually catch one of the little rascals. And I am interpreting pet from experiences with other games too. The chat says "Congratulations, rabbit #xxxxxx belongs to you now". The post was edited 3 times, last by Graysilk13 ( Jan 16th 2018, 6:07am ). I need to apologize to LucTheHunter on our server. He supplied the information on feeding the animals and what the cows and pigs eat, and the process of feeding to get them to breed. Sorry Luc, it was not intentional. Update on the cages so far. The 2x4 grates (not the doors) make a fine cage for the cows. So far the 4 of them seem happy with their home. However the pigs are escape artists. They lean against the bars, or even go to sleep against them and eventually they just sort of melt through until they are on the other side of the bars. I tried putting a block wall, 2 blocks high around the cage, just slows them down: 2 of my 3 pigs have escaped. Not sure what I'm going to do with the chicken and bunnies , they will walk right through the bars. This is fun. Update: the pigs kept walking out of the cage that is the same type the cows are in-lost 3 of 4. I think this is because the one wall of cage was close to the well, about 4 blocks from my well. I found a pig in the well, alive and kicking. Put the pig back and 5 minutes later he's out again, underground by the well. I moved the pigs into a farther away cage, until I can move the well. The post was edited 1 time, last by Graysilk13 ( Jun 26th 2017, 5:28am ). Okay so I followed the instructions but I was unable to breed the animals or keep them in the cages I had built, using those specs, all of my animals got loose and disappeared, as In they ran away and I have no idea where the went, and I looked all over creation for them. I was never able to breed the animals, and I believe this is an aspect of the game that they still have not incorporated into the game, and if they did its buggy as hell. I have the cages still up in case the next update (when ever that will be) and they introduce breeding the animals into the game or fix the severe bugs in it. The Animal breeding is not an original part of the game, it is a plug in developed by someone else. If you explained exactly what you did, perhaps we could tell you whats missing? 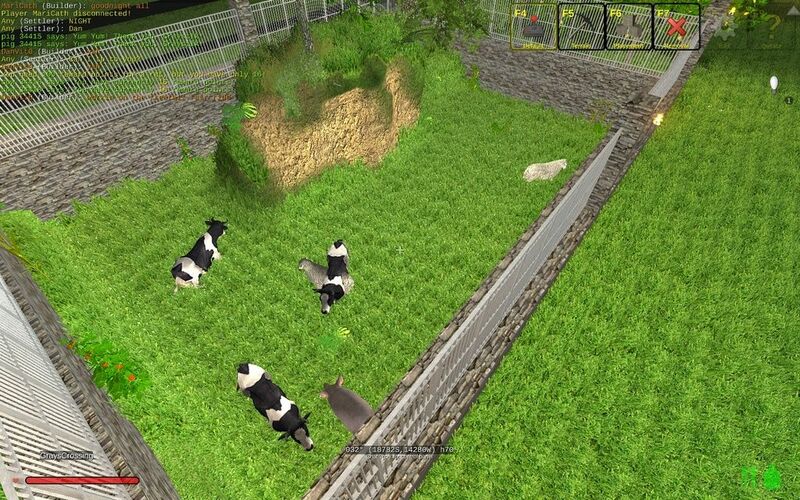 As you fed the animals, you should see progress reports on the screen showing you when the animal is 'ready to breed'. Then feed the other animal, and it too will show progress reports on the screen and after about 5 feedings, it will show the animal is pregnant. Then there will be a countdown on screen showing the percentage as it progresses. The last time I bred animals - it took about 2 hours to reproduce. You have to feed them their specific food only. Pigs eat corn, cows eat carrots. Each type eat diff. food. As to the cages: I found that digging down a little and lining the hole with blocks, then putting up the 2x4 grates around the area, worked well. There are people on one of my servers, Serenity, that have entire zoos of every animal. Also, some used wood planks to build it. some used log fences. Some made tiny cages for them, some huge. There are no major bugs in the Animal plug in, except the naming process. You have to have a piece of paper on you to do it. And you have to log out and back in every time you name a diff. animal. At least the last time I did it that is. Animal breeding has been working well for months, it takes time, and patience. Try again and take it slowly. Good luck. PS the next update is scheduled for today. This is not a game, it is Alpha, and therefore will be incomplete until the dev. says it is done. Can you link it in your first post here which it ist related to? The post was edited 2 times, last by Boing----Peng-Bumm- ( Dec 7th 2017, 8:25pm ). Thank you Deirdre, I didn't realize that was what he needed to know, and could not have told him as I had nothing to do with installing it on my server. Everybody who reads the thread begins with the first post. It would be better to collect all informations there. The post was edited 1 time, last by Boing----Peng-Bumm- ( Dec 7th 2017, 8:44pm ). My problem in linking to any of my old posts is that they no longer exist. I began posting on this forum about 6 months before posting with this current name, Graysilk13. My original posting name was Graysilk. Through a long and involved comedy of errors, I ended up messing up my original acct. when I set up my new pc. I couldn't get my pw to work. So I set up a new acct. and asked Red for help getting the original name back. Didn't work, I just didn't have the correct info., as I had also since deleted the email acct. besides. Don't ask, it is just confusing; I'm still not sure what the heck i did. Anyway, I set up a new acct. and login name, as it was just easier all around. 'Graysilk' can no longer be linked, it does not exist. The post was edited 1 time, last by Graysilk13 ( Dec 10th 2017, 10:39pm ). It is a thread you posted too (Post 112). I have noticed "before" the update pigs stayed pretty much put if you put them in pen built with a fence made with planks and beams. Not sure why maybe the get splinters and back away . The post was edited 1 time, last by icon58 ( Jan 3rd 2018, 5:59am ). what about now? how the animal cathing and breeding works?